November 12, 2003: A suicide attack on the Italian military base in Nasiriyah, Iraq, leaves nineteen dead and scores wounded. Among the survivors is a young, brash, and in some ways naïve Italian filmmaker, Aureliano Amadei, who had arrived only the day before to scout locations for a forthcoming movie. Seriously injured in the attack, Amadei uses the long months of his recovery to reflect upon the circumstances that took him to Nasiriyah, the contradictions of the Italian military presence in Iraq, his country’s response to the “Nasiryah Massacre” and its embrace of the “Heroes of Nasiriyah,” and the official investigations into security failures at the Italian base that tragic day. This is the story of a man who arrived in the midst of the terror, fire, and gunfire of a war that officially didn’t exist … and who came away both permanently changed and more determined than ever to tell the truth of what he experienced. 20 Cigarettes, the 2010 Italian film based upon this book, won eighteen national and international prizes, including Best First Feature at the Italian Golden Globes, the Young Cinema Award and the Kodak Award at the Venice Film Festival, Silver Ribbon from the Italian National Syndicate of Film Journalists, and other awards at the Lecce Festival of European Cinema, Salerno International Film Festival, and the David di Donatello Awards. “Excellent translation…. I cannot recommend either the book or the movie highly enough. Both are better than anything else I have seen or read about America’s misadventure in the Middle East.” See James van Maanen’s entire review on TrustMovies! “One of the best books about the modern experience of war, from a victim’s perspective, that I have read…. The author’s style is elegant, but also immediate and compelling—this is an intensely readable book.” ~ Dr. Frank Huyler, emergency physician in Albuquerque, New Mexico, and author of the essay collection The Blood of Strangers and the novel The Laws of Invisible Things. “In a clear, compelling voice, Amadei takes us beyond the rhetoric of war to all the complexities of the actual experience. The layers of searing pain, misperception, the invisibility of individuals, kindness, hypocrisy, empathy challenging long-held beliefs, official and public myopia and – most improbably – moments of humor, are a great read.” ~ Ginny Morrison, Mediators Beyond Borders. “This dramatic event, as real as it is surreal, is recounted in the language of friends seated around a supper table. The book is too honest to take advantage of the benefit of hindsight or to try to make its author seem better than he is, and Amadei carefully avoids gross generalizations. [This book] can be read all in one gulp but nevertheless leaves an indelible mark.” ~ Riccardo Toniolo, Scienza e Pace, the magazine of the Interdisciplinary Center for the Sciences and Peace, University of Pisa. “The book is antimilitary, antiwar, ironic, and unconcerned with rhetoric even as it makes clear the ‘other side’ of the story of Italian military presence in Iraq (known to most of the Italian public as a ‘humanitarian mission’)”. ~ Adelchi Belluco for the Giacomo Matteoti Cultural Association, Rovigo, Italy. 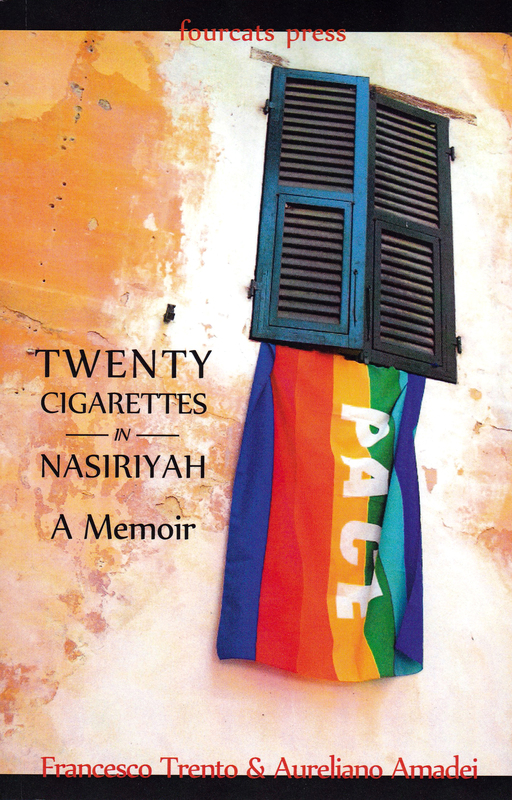 Ask your local bookstore to stock or to order Twenty Cigarettes in Nasiriyah: A Memoir, or view a preview on Amazon.com. Online ordering also available from Barnesandnoble.com, and other online booksellers. This entry was posted in New Releases!.